Fmr. White House Communications Director and Reform Party candidate Pat Buchanan accuses Israel of manipulating US to fight Iran. Conservative commentator, three-time presidential hopeful, and former White House communications director Pat Buchanan slammed Israeli Prime Minister Binyamin Netanyahu on Monday, following Netanyahu’s video address revealing evidence the Iranian regime lied about its nuclear weapons program. The address highlighted 110,000 documents and files obtained by Israel during a January 2017 operation at a secret Iranian facility in Tehran. While Iranian officials have repeatedly denied claims the country worked towards obtaining nuclear weapons, on Monday Netanyahu revealed evidence from “Project Amad”, which operated from 1999 to 2003. Following international pressure, Iran began covert efforts towards achieving nuclear weapons capabilities, Netanyahu claimed. Shortly after the speech, President Trump called Netanyahu’s address “the right message”, and warned Iran was “not sitting back idly”. Trump has vowed to make a decision by May 12th whether to end sanctions relief for Tehran, a key provision in the 2015 Iran nuclear deal. European leaders, including European Union foreign affairs chief Federica Mogherini downplayed the significance of the evidence, arguing that it did not show Iran had failed to comply with the terms of the nuclear deal. “What I have seen from the first reports is that Prime Minister Netanyahu has not put into question Iran's compliance with the JCPOA [Joint Comprehensive Plan of Action] commitments, meaning post-2015 nuclear commitments,” she said, asserting that an agreement was needed due to lack of trust between the sides. Conservative pundit and former White House Communications Director Pat Buchanan also dismissed the evidence brought forth by Netanyahu Monday, warning that Israel was attempting to maneuver the US into a war with Tehran. In an interview with Sean Hannity Monday, Buchanan claimed Iran had no desire to build a nuclear weapon. "Bibi has been crying wolf for decades. US intelligence agencies in 2007, and again in 2011, said with high confidence...that they had no evidence of a nuclear weapons program in Iran. Subsequent to that, we had the deal,” said Buchanan, drawing on Iranian Foreign Minister Mohammad Zarif’s comments earlier on Monday describing Netanyahu as a ‘boy who can’t stop crying wolf’. “The reason the Iranians signed the deal is because of the truth of what American intelligence said... they didn't have a nuclear weapons program. "Ahmadinejad said, 'look, I'm not stupid. If we spent all this time, money, energy and money building an atomic bomb, and the Americans have 5,000?' One atomic bomb? "The reason Iran doesn't have a bomb is that they don't want it. They could have built a bomb." Buchanan suggested that evidence to the contrary was part of an effort by Israel to draw the US into a war with Iran. "Now, if Iran has a nuclear weapons program and is working on it and its secret, that'd be an abject failure on the part of American intelligence." "Bibi Netanyahu, with due respect, wants the United States to fight a war against Iran on Israel's behalf. I don't want my country getting into another war." A controversial figure within the Reagan White House, Buchanan was heavily criticized for reportedly encouraging President Reagan to visit a German military cemetery in Bitburg during a 1985 trip to West Germany, despite the fact that nearly 50 Nazi Waffen SS soldiers were buried in the cemetery. In 1992, Buchanan challenged incumbent Republican President George H.W. Bush during the GOP primaries, winning nearly 23% of the vote, including a near-win in New Hampshire. 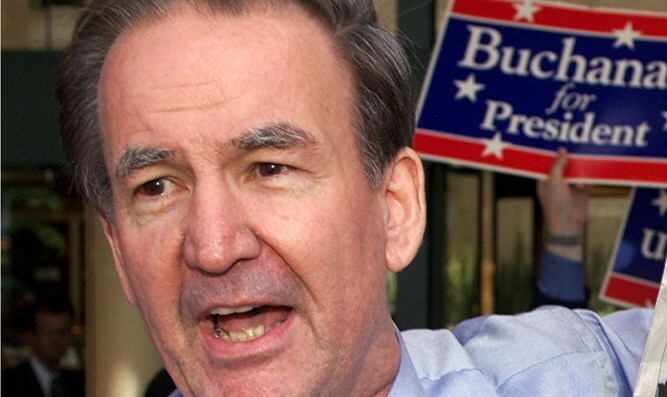 After losing a 1996 bid for the Republican presidential nomination, Buchanan left the GOP for the Reform Party, running against Donald Trump for the party’s nomination. Trump later dropped out of the race. Buchanan strongly backed President Trump’s 2016 presidential bid. Critics, including National Review founder William F. Buckley, a prominent figure in the American conservative movement, have accused Buchanan of anti-Semitism, citing his comments on the Holocaust and US policy in the Middle East. Following a 1990 piece by Buchanan denying that 900,000 Jews were systematically killed at the Treblinka concentration camp, Buckley penned In Search of Anti-Semitism, saying it was “impossible to defend” Buchanan against allegations of anti-Semitism. In 1990, during the lead-up to the Gulf War, Buchanan accused “the Israeli Defense Ministry and its amen corner in the United States” of drawing the US into war with Iraq, and later described Congress as “Israeli occupied territory”.